Castor oil has a whole lot of benefits. As a child, some of us would remember taking castor oil as a laxative once every six months to detoxify the body. It is still a much-recommended grandma’s traditional medicine for many health problems. In this article we will look at some of the top Health Benefits Of Castor Oil. Castor oil has plenty of benefits for the skin, hair and body. It’s anti-inflammatory and antibacterial properties help in keeping the body healthy. Castor oil is used for treating various skin infections, hair fall, giving relief against constipation etc. 1. Castor oil helps in relieving stomach ailments and constipation. Castor oil is a mild form of natural laxative, which helps in giving good bowel movements and also gives relief against constipation. The ricinoleic acid present in castor oil helps in the process of digestion, nutrient absorption and cleansing of the body system. It further helps to remove the toxic waste from the body. It also helps in maintaining a balance, by having more good bacteria and eliminates and removes the bad bacteria from the body. 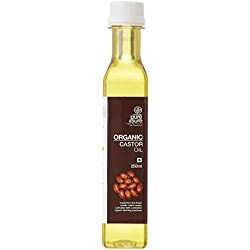 Some easy ways to have castor oil is to take a teaspoon of castor oil with a glass of cold milk and have it on an empty stomach to give relief against bloating, constipation and acidity. It is a natural laxative and so is safe to consume. You can also add a teaspoon of castor oil to a glass of fresh orange juice and have the same on an empty stomach, first thing in the morning. Keep drinking warm water every half an hour. You will get motions and your stomach will become clean. These are some amazingly simple homemade remedies for getting your stomach clean by removing all the toxins from the body. 2. Castor oil improves the blood circulation in the body. Castor oil helps in improving the blood circulation by helping in pumping the blood to and fro from the heart. It also helps the movement of oxygen throughout the body thereby detoxing our bodies. 3. Castor oil helps in boosting the immunity system. Castor oil has properties which help in fighting off diseases. Research has also indicated that when it is applied topically, it increases the defense mechanism of the body. The T-11 cells help in fighting off toxins and promote better health. 4. Castor oil also helps in inducing labor in pregnant women. Castor oil is a traditional and natural way of inducing labor. Even today doctor’s use castor oil for pregnant women who have completed their full term, to help in increasing the contractions. The only reason that it is not very popular is because of its taste and smell, many women get a nausea feeling and hence are reluctant to take it orally. 5. 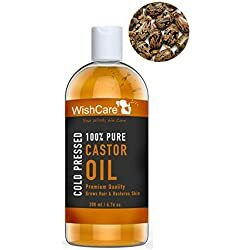 Castor oil is good for the skin. Castor oil has some amazing health benefits for the skin. It helps to keep the skin healthy and rejuvenated. · Castor oil heals inflamed skin caused by dry skin, sunburns or acne. You need to take a cotton ball, dip it in castor oil and apply it directly on the affected skin area and leave it on for an hour before washing it off with cool water. 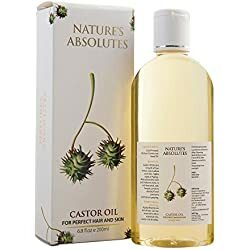 · Castor oil helps in moisturizing the skin and in keeping the skin smooth and supple. After washing your face, just massage the face with a few drops of castor oil for a clean and smooth skin. It hydrates the skin and is an important ingredient in many beauty products. 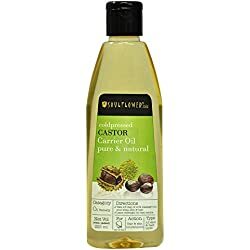 · Castor oil helps in reducing acne and blemishes on the skin. Wash your face with water and then apply Castor oil and massage it in a circular motion on the face. Leave it overnight and wash it first thing in morning.
. The ricinoleic acid present in castor oil helps in penetrating the skin and is an excellent remedy for fighting acne. Regular application of castor oil helps in fading scars and blemishes on the skin. · Castor oil helps in reducing pigmentation and other spots on the skin. The omega 3 fatty acids helps in stimulating the growth of healthy tissue, thereby helping in removing uneven skin tones. · Castor Oil helps in fighting anti-ageing. Applying castor oil on the skin helps in stimulating the production of collagen and elastin. This further helps to soften and hydrate the skin thereby removing the fine lines and making the skin look young and supple. · Castor Oil helps in reducing stretch marks. 6. Castor oil is good for the hair. Castor oil helps in giving long and shiny hair. 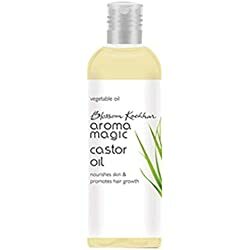 · Castor oil promotes hair growth. Apply castor oil to the scalp and massage it gently. It helps boost the blood circulation, thereby reducing split ends and controlling hair breakage. · Castor oil helps in treating scalp infections like dandruff, itchy scalp or hair fall. · Castor oil helps in preventing premature greying. Just start applying castor oil at the first signs of greying and you will see the difference. 7. Castor oil helps in reducing the joints and arthritis pain. Castor Oil helps in providing relief to joint pain and other arthritis problems. You need to take a cotton cloth, soak it in Castor oil and then squeeze out the excess oil and place the cloth on the affected part. Now cover it with a plastic wrap and then apply the heating pad on it. The anti-inflammatory properties help in giving relief to the inflammation and sore muscles. · It helps in fighting skin disorders, infections, viruses and bacteria in the body. · It helps in reducing the itching and swelling of the skin. · It can be applied to chapped lips for smoothness. · It helps in getting rid of moles and cysts. We would encourage you to use castor oil to get relief from many diseases. It is inexpensive and safe to use. 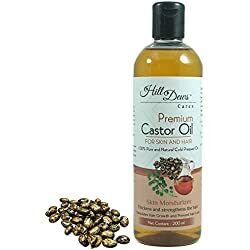 The above health benefits can give you an insight of the tremendous advantages of using castor oil in your day to day life. Hope you enjoyed this article Health Benefits Of Castor Oil. Please read our earlier article Health Benefits Of Cabbage. Please check out our Smart Shops.